As per the request from one Classic Shell user here, I created a Windows 8 Start button with Microsoft logo colors. Set the button size to 42/44/46 (sizes for 100% DPI) - or whatever size suits you. Edit: If you use a higher DPI, there is a sharper button below appropriate for 125 DPI. Yeah, this is what I wanted . The shinning effect would be awesome there though , but for now, I'm setting this as my start icon. Thank you so much! 1. Same design and size W8 logo, but with official colors: red, green, blue and yellow. Transparent background of course. 2. When you hover the mouse over it, the background is still transparent, the logo has the same colors. The only thing that happens is the glass effect. This icon should be the the official Windows 8 logo, it's pretty obvious why. And it seems that it is not a requested icon, that is weird. That's a screenshot of my 1920x1080 screen, scaled 125%, with the pixels as they are displayed, as I can see them, just zoomed in with Photoshop (in other words, there's no AA filter or soft filter or anything like that). I've set the button size so THIS PC shortcut is in the same position (size 56), so the button occupy the same space as the original Windows 8 logo. 1. Your icon is not as sharp as the original one. Notice the left and right sides are kinda softened in the last pixel columns. 2. The centered cross is softened too. 3. The dimensions are not the same. You icon is wider (and just wider). BOTH heights of the left side and right side are THE SAME. So your icon is almost the same, just stretched tight. 4. Your icon doesn't start in the same position as the original (distance to the left side). To accomplish this, I have to set the size next to 46-47, and then, both icons have the same distance to the left side of the screen. These issues are always there, doesn't matter if I set the size 42,44,46,50,55,56,57... So the icon always looks blurry, which is noticeable and undesirable. I've moved the upper original icon to the left so you can compare the width. AND finally, I just wanted to say thanks again and say that Classic Shell is THE REASON I'm still using Windows 8.1. No good start menu, no Windows 8.1. Thanks to God, I found this software. Since you use a 125% DPI, this button is getting scaled which is why I think you are seeing scaling/size issues. I don't know if the image scaling algorithm that Classic Shell uses to scale the button (WIC fant) is better than bicubic, or whether it's worse. 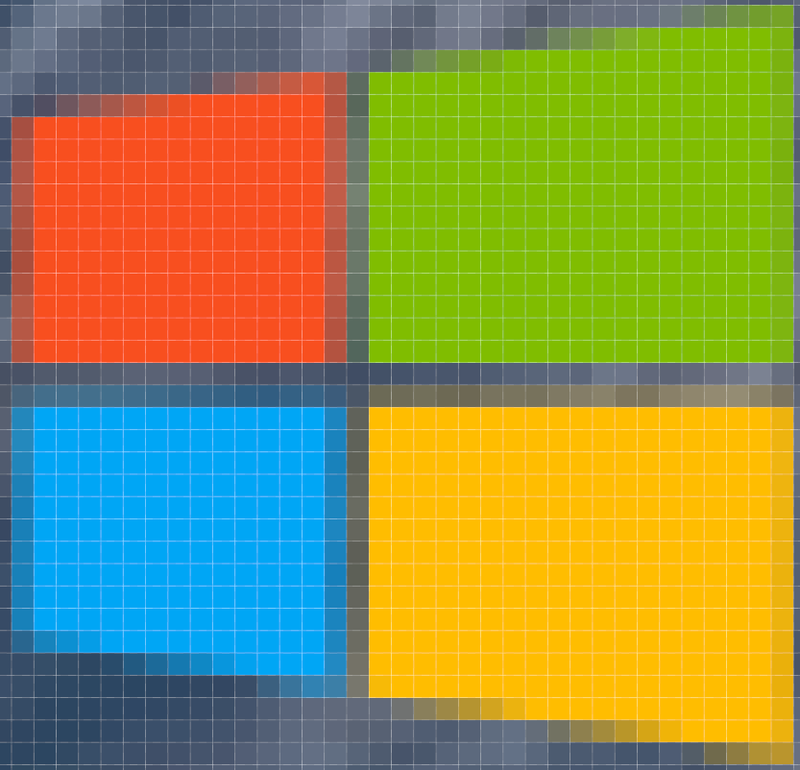 The original Windows 8.1 logo that you compare it with might be a larger sized image optimized for 125 DPI that Windows 8.1 might be automatically switching to when a higher DPI is being used. I matched the original button size only at 100% DPI. You could try resizing the image itself using bicubic to suit your DPI and set the button size to 0 (Automatic) in Classic Start Menu's settings. For best results you should not use scaling of the image. It will always produce lower quality results than an image that is built for a particular size. But as I said, I've tried a lot of different sizes, and every single one had this blurry effect, which means it's an icon's problem. Indeed, if you look at the icon, you'll see this effect. I've tried also a lot of buttons, and they were not blurry, so "scaling" the items is not a problem here. Also, the icon is not the original, cause it's wider. BTW, I'm using it right now, and it's what I want, it's so cool, but you know, I'd like it to be more perfect. when you say you've tried alot of different sizes, what do you mean? you had an original icon of "56"? is that 56x56? and how did you get the different sizes? did you yourself create 8 different sizes of the icon? or did you find 8 different sizes online? and if you did make them, how did you get them to different sizes? and if you downloaded several different sizes, do you know how the other person made them? You need to create your own Icon from Scratch, at 256 x 256, as a PNG.. you can do it as a new layer over that one for precision, and then delete the original. This is the only way to have clean, crisp detail at larger & smaller sizes. and what do you mean "Glass effect"
each color panel gets a glass panel look over it? here is one i've made to look like what I think is the same as the original one you wanted above.. Thanks! I take the first one, though there's no almost no difference, only if you look at the icon the time you're changing it. Nevertheless, I'm not agree with you. The icon provided by GauravK has more resolution than my final button, so I'm killing pixels there, I'm downscaling the images, so I don't need any larger resolution icon. I'm still see the blurry border sides, and the center cross is 1 pixel "fatter". It should be just 1 pixel, I'm still getting 2 pixels. See? I know it's not finished, but there shouldn't be any intermediate color between yellow and the white background (except the lower and upper sides, that need those intermediate tone to smooth the line), cause that's what is causing the edges look blurry. 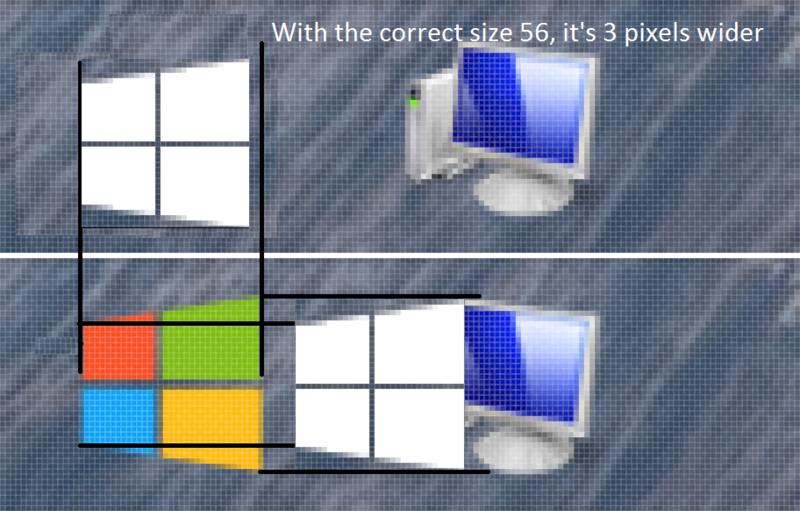 In your case, your icon have much more resolution, but there's still a small line in the left and right side. The "program" or whatever is reading the image is considering and displaying those lines, and as the minimum pixels it can use is 1, the result is almost the same as the lower resolution icon. well, it will always do that when you zoom in.. no matter how big you make it, since you are essentially adding information which isnt there.. unless you make a vector graphic, which doesnt have that limitation..
if you make it at the size above that you posted, it will still have the same limitation when zooming in..
but even though it was made in the native PSD format, exporting to any format will change how its displayed..
and the size I posted I already WAY bigger than any display on the market can handle for a Start Menu Orb..
Like I said and Ivo reiterated, you are not using 100% DPI plus not the default size of the button. There WILL be interpolation artefacts taking into account the adjustments necessary for the increased DPI as well as different size of the button (compared to the image dimensions). Instead, if you resize the image using a bitmap editor to suit your DPI where Button size setting is at 0, you may get sharper results. Resizing an image using a bitmap editor is not that hard. Any free editor like Paint.net or Gimp can do it. I will try to upload a sharper image if I get time to make it. No, no, no, no, first of all, I did that zoom in to show you guys that the image has this semi-tone around each different square, and THAT shouldn't be there, cause that's what's causing the blurry effect. Basically, you have to use JUST 4 colors: Red, Green, Blue and Yellow. The image should only have 1 tone per color. BUT, to smooth the upper and lower sides, you have to use those different tones, so it doesn't look jagged. 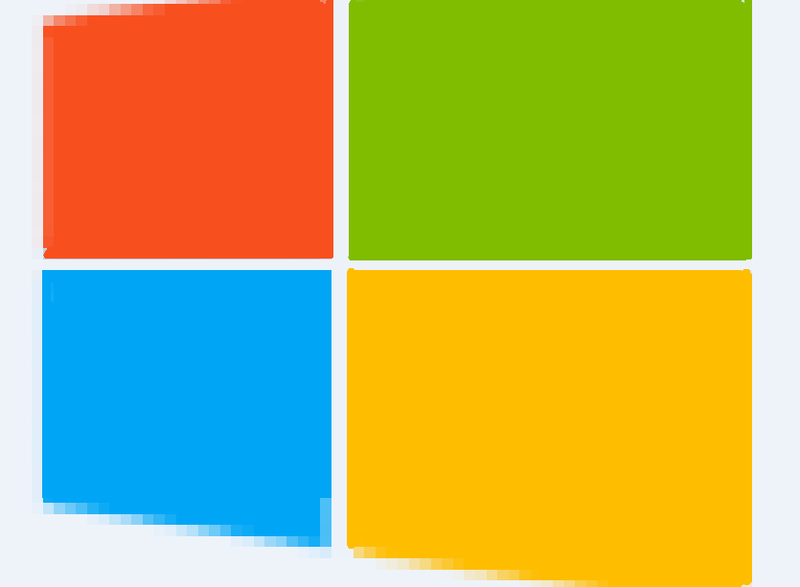 Just look at the Microsoft original logo that I put in this post, it has only 1 color, 1 tone: white, but, to smooth the upper and lower sides, it includes some different tones there. The left photo is zoomed in with Photoshop. Well, this program automatically applies an AA filter or something like that if you're zooming in less than x2, so the photo looks proportional and nice. The right photo is zoomed in with Windows Photo Viewer, which DOES NOT apply any filter. Again, as the server I uploaded the photos applies a filter, it is not as sharp as it should be, but the right photo is sharp as hell, but doesn't look proportional, and it's deformed as the zoom is not an integer. So, both are working with the same image, both are zooming in the very same image, but Photoshop is "making up" some pixels, and W Photo Viewer no, it's just upscaling, and when you use a decimal zoom in, you get that. I know the size I posted is not going to fix it, indeed, that's what I'm trying to explain here. I just zoomed in the icon so you can see the semi-tone color in the borders, that shouldn't be there. To sum up, could you remove those semitone colors? Last edited by rambomhtri on Mon Jun 30, 2014 6:52 am, edited 1 time in total. But that make no sense, cause I've tried many different buttons, and all of them looked sharp and nice. AND, your image has MORE pixels than what I need, so the image is being downscaled, so it shouldn't make up pixels, it should remove pixels from the original, so semitones, if they're not in the original image, they shouldn't be in the icon. If an image is downscaled then the new pixels will contain a mix of multiple original pixels. If they have different color then you will get new colors. The same applies to the alpha channel. Even if the original image is very sharp and contains only 100% transparent and 100% opaque pixels, when you downscale it you may get pixels with any degree of opacity. The alternative is to use the "nearest pixel" downscaling algorithm, but it produces very low-quality images. If you are not satisfied with the way the start button resizes the images you must do it yourself in a graphics program and then set the size to "0" in the settings. If an image is downscaled then the new pixels will contain a mix of multiple original pixels. If they have different color then you will get new colors. What? How can they have different colors than the original icon? I didn't understand this one. How can I do that? Can I edit with paint the 3 icons and then save it as png? If you mix 2 pixels with the same color then no matter the ratio in which you mix them you will get the same color. But if you mix 2 different colors you will get new colors. Same for the alpha channel. If you mix one transparent and one opaque pixel you will get a semi-transparent pixel. Imagine a 100x100 image resized to 50x50. Every new pixel is the average of 4 original pixels. If 2 of those pixels are white and 2 are black the new pixel will be gray (even though the original image doesn't contain gray). To manually resize an image you need a painting program that understands transparency. Paint doesn't work. It will destroy the transparency. You need a more sophisticated tool like Photoshop, Paint.Net or Gimp. If they repaint those lines, and I'm still getting this undesired effect, then I have to do a custom size icon. well, I actually forgot to delete the underlayer, so It was a bit 'fuzzier' than it should have been..
and the reason for that is that pixels are square, not diagonal, if they were hexagonal or octagonal I'm sure things would be different, so unless you have no diagonal lines, as in the second set of logos you posted where all the lines are either horizontal or vertical, your lines at any other degree off of the X & Y plane are going to be jagged hard drops.. In fact, the only reason blending of pixels & transparencies ever occurred was for non-X-Y lines..which is really most graphics other than squares or rectangles. a solution we used to use in the old days was to simply make the image very large so the pixels werent so obvious when zoomed out for viewing..
like they said above, the best way for you would be to create an image exactly as you want it, at the exact size you want it, then set the size to 0 to that it displays the size you created it..
but this PNG is perfectly clear, as I'm sending it now. Thanks again, but as I said, it doesn't matter how big you do your image, I'm killing almost ALL pixels of it. What the freakin' hell for God's sake! Why are those semitone pixels being displayed? It's a 35 pixels width and 34 pixels height image. I think the best way to accomplish this is to create with the same resolution and size it to 0, so there's no scaling. 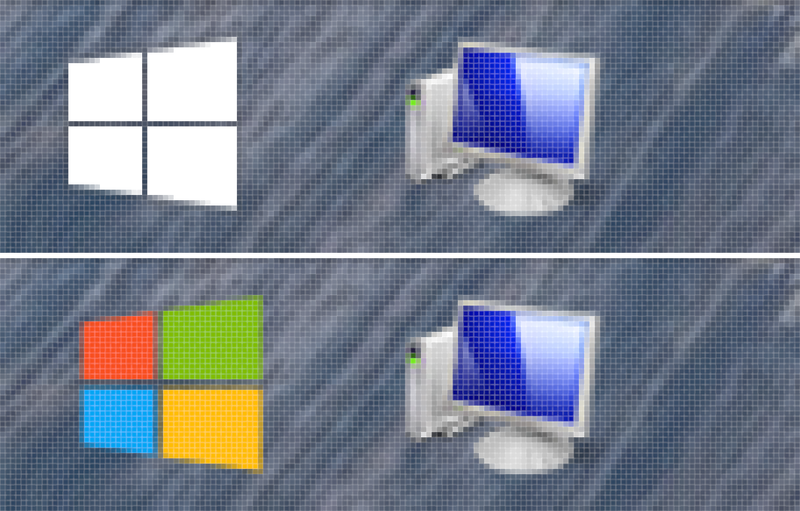 The Windows 8 original logo's cross is 1 pixel fat, and I'd like it to be like that, just 1 pixel row and 1 pixel column. By the way, the diagonal lines were fine as they were, you didn't have to change them. That's exactly what I've explained before, that diagonal lines must have like 4 or 5 semitones, so it doesn't look jagged. 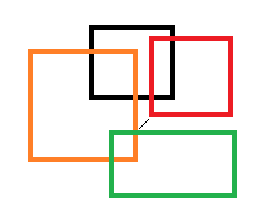 I think the best solution is to use solid colors in the RGB channels (even make them much bigger than necessary), and then give it shape by changing the alpha channel. There should not be semitones on the RGB side. That's because you don't know what the background is going to be, and you can't pre-blend it. Still, when the image is resized you will get pixels that are not exact. There is no way around that. well, I showed you a screenshot of maximum zoom of what I made.. on 100% transparent background, RGB mode, PNG, and it had no smoothing..
but what you'll find is that most programs, viewers, and about anything that touches an image does some sort of rescanning and renders/interprets the image with an algorithm to smooth the image... even if it doesnt actually change the image itself.. just in the way it displays it..
You could try some of the Windows Live image tools, or maybe even MS Office Picture manager, if you have an older version of office lying around.. but that wont do you much good if whatever you're displaying it with displays a smoothed image during interpretation. anyway, I think we can safely say its something on your end.. as those edges were block-erased the old fashioned way, at the pixel level. I recommend Paint.net for creating a new 35 x 34 image .. its easy to learn and has a lot of functionality for most basic graphic art work. just create a new image thats 35x34, open your current Icon for reference, place a layer on top of it, and draw upon the new layer , sampling colors from your original as you go. @rambomhtri, try this button. I think at 125% DPI and size 0, it should exactly match the Windows 8.1 original button dimensions and sharpness. That said, what I guessed above was right. Windows 8.1 internally switches to a different image when you increase the DPI, it doesn't scale the image. I suspect it has Start button images in its DLLs all the way up to 500% DPI. Even at smaller sizes/100% DPI it doesn't downscale a larger image. Unscaled image=higher quality if you want pixel perfect sharpness. unless your face is right on top of your screen or something.. I really dont get what you are after.. are you saying its actually an eye sore? that you can tell it doesnt look like the original? please post some screenshots between your win 8.1 original icon, and one of the better ones above in classic shell..
YEEEEEEEEEEEEEEEEEAH, I love you GauravK, hell yeah, now it is sharp as hell, damn right, xD. There's so much myth about high dpi screens. I'm telling you, I've been using for 10 years a laptop with a 4:3 1366x768 15.4" screen. Just 5 months ago I bought a Lenovo with a Full HD display 16:9 1920x1080, and dude, there's a HUGE difference, HUGE. You can TOTALLY tell if there one more row of pixels. I really think that the best 15.6" resolution is 8K, where then you shouldn't be able to see any pixel at all. Nevertheless, I've noticed something weird in the image, lol. I'm posting a new message. File comment: Where it's supposed to be a transparent background, it's NOT!!! WTH!!!!! Ah I forgot to delete the pixels taken by the 1 pixel cross and make them transparent. That is easy to fix. Here is the fixed version. Btw, I spent quite a lot of time on this image. Finally, sharp and nice. Thank you so much for your effort, dude. One more thing, I've compared the transparent background of the 2 icons, original and your fixed one, and when I put the original logo, the background is slightly darker, only noticeable if you're zooming in the image and comparing pixels that are joined, just like my last message. Of course, I don't give nothing about this, but I just wanna know why is this happening. Thanks again! lol indeed it appears so. No idea about that either why the background shade is different. Maybe it's because of the different way in which a custom Start button is rendered. There's a option to scale the Start Button, called "Button Size".